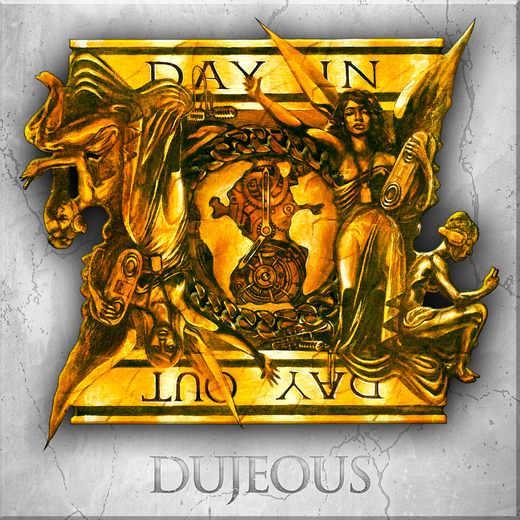 Dujeous (doo-jee-us), acclaimed New York hip-hop band, are gearing up for their sophomore album, Day In Day Out. With buzz building—not to mention cameos from John Legend, Sharon Jones, Immortal Technique and Maya Azucena—the LP is set to take Dujeous to a new echelon when it drops April 3 through Empire/Dujeous LLC. But one thing has remained constant: a goal of redefining what it means to be hip-hop. MC-singers Mojo, Mas D, and Rheturik keep the rhymes to-the-point and provide stellar three-part harmonies. Bassist Apex and guitarist Taylormade, the group’s main producers, create lush backdrops that effortlessly blend melody with boom-bap bounce. Meanwhile, trumpeter Dave Guy, also a member of funk-soul outfits The Dap Kings and Menahan Street Band, brings ethereal jazz textures to the proceeding. Day In Day Out is also stocked with contributions from the Duj’s talented extended circle, including John Legend, rap provocateur Immortal Technique, and funk queen Sharon Jones, who appears on the single and video, “Spectacular,” an inspirational banger punctuated by horn swells and a throbbing backbeat. The video has received heavy airplay on BET’s Centric and Video Music Box. In advance of the album, Dujeous released a free mixtape in February, Dusk Till Dawn, with appearances from Skyzoo, Smoke DZA and Potluck. Meanwhile, last October, Taylormade and Mojo’s side project, The Next, released “This American Life,” featuring Talib Kweli and Immortal Technique, which became a blog favorite via 2DopeBoyz, Okayplayer and elsewhere. To say that fans’ ears have been primed for the release of Day In Day Out would be an understatement. With a new-and-improved sound, a new focus, and a new album, Dujeous is ready for new eardrums, new stages, new continents and new levels of success.